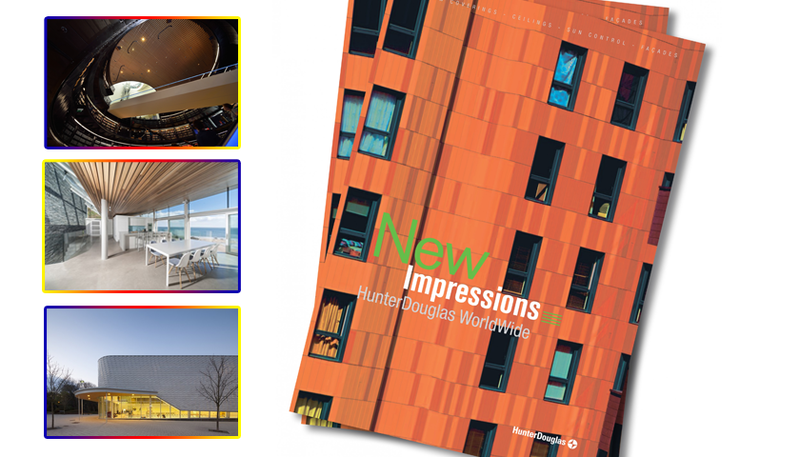 A shiny coffee table book has been released displaying multiple striking and innovative building projects by Hunter Douglas, which the international leader in architectural building products, has helped to develop. New impressions contains displays of 81 amazing schemes spanning from Abu Dhabi o Sweden and North America to Russia. In amongst them are the $413 Us million Kauffman Center Performing Arts in Kansas, in which Hunter Douglas has manufactured custom-engineered roller shutters, and the €21.47 million ZAC Chalbre training complex in Paris. It fitted facades of TERRART® Baguettes that is similar to bamboo latticework. Also featuring in the high quality book is three-prestige project in the United Kingdom. First, is the Unigrid and wood ceiling at the award-winning Library of Birmingham, England that opened its doors in September 2013 at a cost of £188.3 million. Hunter Douglas manufactured a tailored solid wood ceiling system using African Ayous and a floating ceiling in black and white. It still stands as one of the most prestigious timber-based projects that the company has undertaken in the UK to date. In South Shields at The Haven Point is also highlighted. This eye-catching leisure complex in the north of England comprises 21,600 individually organised terracotta elements, using NBK TERRART® large and custom factors. A residential property in Coldingham Bay, Scotland, The Pavillion requested that Hunter Douglas produced a solid linear open ceiling in western red cedar.